Green Writers Press, 9780989983891, 336pp. 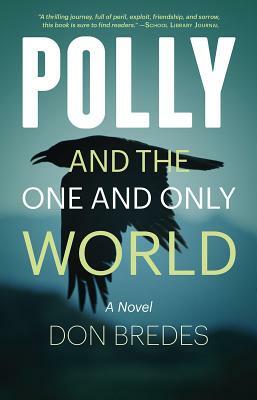 Don Bredes's new young adult (YA) fantasy is called Polly and the One and Only World. Don's first novel, Hard Feelings, was an American Library Association Best Book for Young Adults in 1977, a New York Times Notable Book, and a 20th Century Fox feature film. Polly and the One and Only World is set in a much-diminished future America called the Christian Protectorates, a poor country ravaged by coastal flooding, drought, and cataclysmic social upheaval, the story features 15-year-old Polly Lightfoot, a maiden witch of rich heritage and tender ability in the craft. When the story opens, Polly is forced to flee New Florida, where she has taken temporary refuge to escape a military purge of the country's infidels, pagans, and followers of false creeds. With the help of her steadfast familiar, Balthazar, a raven, and her brave teenage companion, Leon, whom she meets on the way, Polly undertakes an epic journey from the deep south to the wild north to be reunited in Vermont with her family and to save her ancient craft from obliteration. Don Bredes is a versatile, visionary novelist. His frightening, vividly realized depiction of our stricken land in the stifling grip of fundamentalists offers young readers a galvanizing motive for preventive action. Not only do readers learn a great deal about witchcraft and religious oppression, but the chilling aspect of an America dominated by hateful zealots in the wake of climate catastrophe presents them with an inspiring challenge-today-to forestall the dire consequences of climate chaos. Gloomy though Polly's world may be, her story does not make use of the horrific realism found in dystopian novels like Cormac McCarthy's The Road, or even in Susan Collins's Hunger Games. Rather, Polly and the One and Only World gives young readers a vision of a future that will inspire them to appreciate their own freedom and their own capacity to work for positive social and political change. Don Bredes lives in the hills of northern Vermont. He earned an MFA in Fiction from the University of California at Irvine and an AB in English Composition from Syracuse University. He has been a Wallace Stegner Fellow in fiction at Stanford University, and he has been awarded fellowships. His popular and controversial first novel, HARD FEELINGS (Atheneum, 1977), was an American Library Association Best Book in 1977 and a 20th Century-Fox film release in 1982.